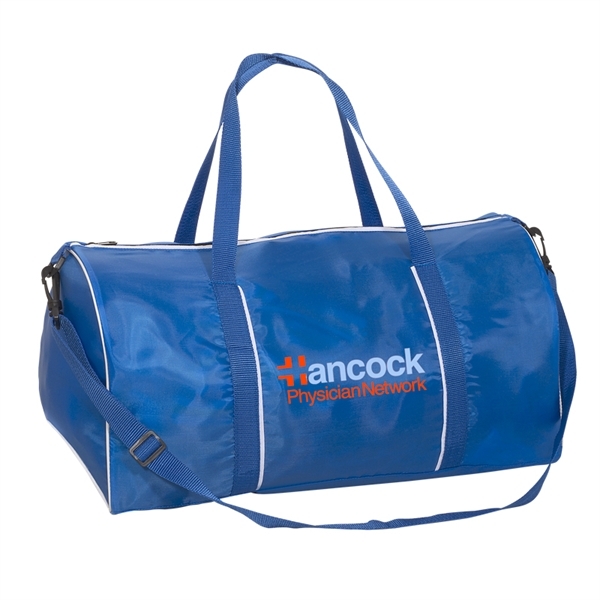 Workout a new marketing plan that includes this Blake duffel bag! Measuring 20" x 10.25" x 9", it's available in two colors and made of 210 denier polyester. It features 100% polyester web dual carry handles (22.5" x 1"), and adjustable 100% polyester web strap (extends up to 40.75" x 1") and a large main compartment with zipper closure. Hand wash only, no iron. The weight tolerance is 6.5 lbs. A great giveaway at fundraisers, sporting events and more, this must-have bag will stand out even more once imprinted with your logo or company name! Size: 20 " x 10.25 " x 9 "
Price Includes: Per piece, per location including the first. We will apply of Prop 65 warning labels to all orders being shipped to the state of California. Insertions requiring individual attention per unit.